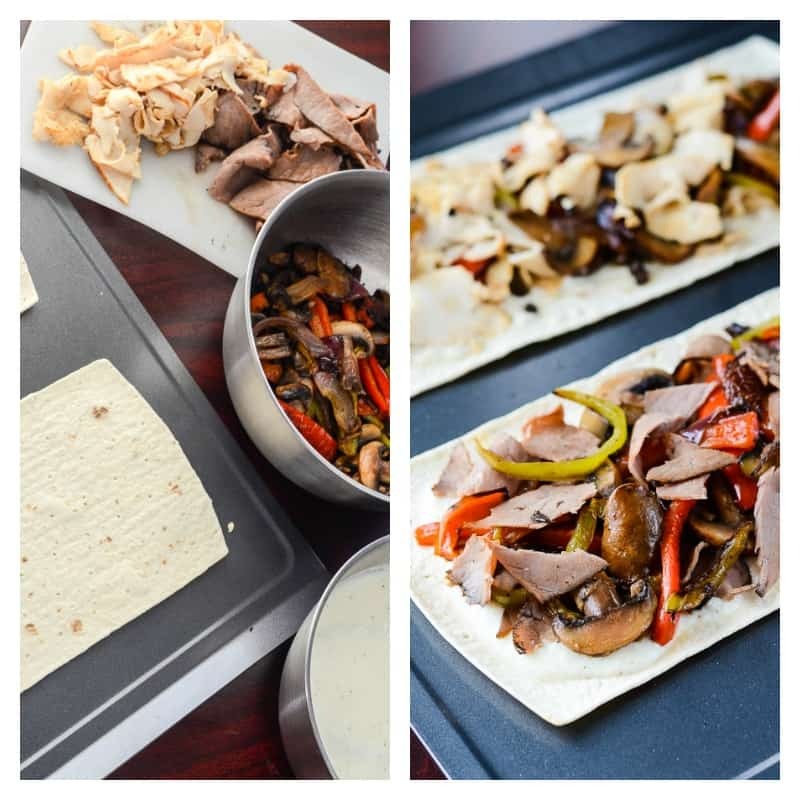 These individually sized Cheesesteak Flatbread Pizzas are perfect for lunch or a quick easy dinner, and are a great new take on one of America’s favorite sandwiches. Make them with classic beef or switch it up with chicken! Pizza: The world’s most perfect comfort food. I’m not sure how valid that statement is, but I’m going with it. Pizza is a wonderful, versatile food. It works as any meal, yummy hot out of the oven or cold the next day. With small adjustments to the toppings, it can go from classic pepperoni to sweet-and-savory Hawaiian to some crazy gourmet Asian-fusion masterpiece with sashimi and burrata. The best part about pizza (yes, other than the gooey, stringy cheese strands) is that it’s so flippin’ easy to make! And I don’t mean pick up the phone and dial up some cardboard box junk, either. 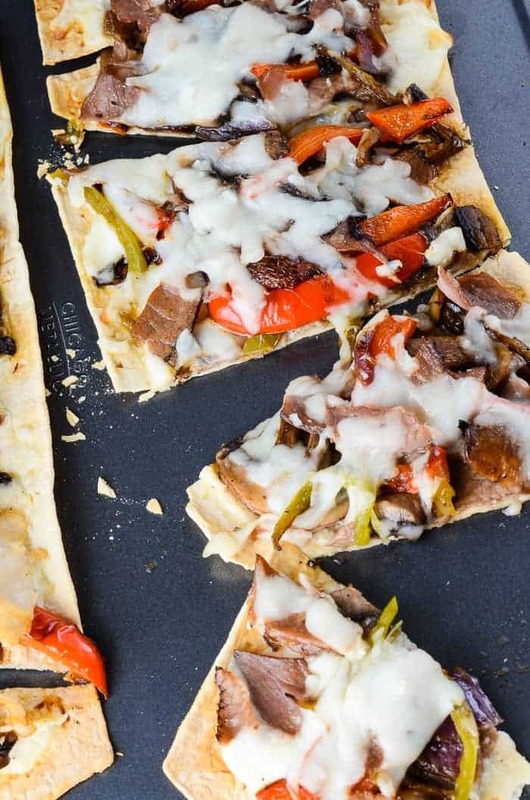 Sometimes, you just have to do it yourself, and I promise that this Cheesesteak Flatbread Pizza will have you nodding your head in agreement…as you twirl cheese strands around your tongue. The most time-consuming part of this pizza is the cheese sauce. And at 10 minutes of prep time, you won’t even bat an eyelash. Bobby Flay’s Provolone Bechamel sauce is amazing for this, as well as any type of cheesesteak. I’m not sure what provoked me to ditch the roll and opt for a flatbread pizza crust, to be honest. I’ve been sitting on the idea of a Philly Cheesesteak pizza for a while now, and I spotted these new Flatout crusts a few days ago and grabbed them, knowing I’d do something with them. Cue a day later and I’m frantically running around cleaning the house after a day of baking and photographing, and trying to figure out what to make for dinner before Mr. Crumby gets home from work. That’s a typical day off for me. Cram too much in, run out of time to plan for the evening. Story of my life. Dinner is often a happy accident. I searched the fridge, which had just been restocked with lovely, fresh produce, and found some lunch meat I had forgotten about. Huzzah! No need to cook a steak or chicken for these little babies! Less prep work is always a good thing. In about a half hour, I pulled these heavenly smelling flatbread pizzas out of the oven, just in time for Mr. Crumby to come rolling in the door. 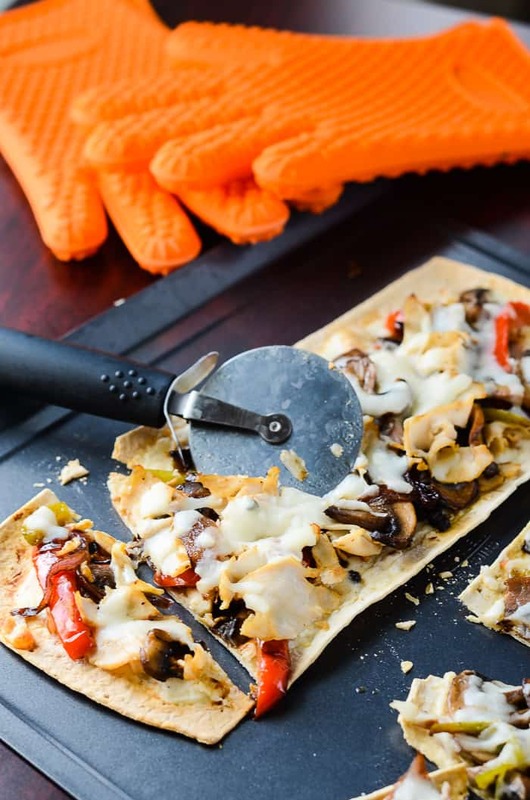 Speaking of the oven, I was asked to review these cute Silicone Baking Gloves just in time to make these pizzas! I never buy potholders. Not because I don’t need them (I actually really did), but simply because it never crosses my mind to grab any while I’m out shopping. Believe it or not, I usually avoid the kitchen aisles, simply because I’d want to buy everything. Now, I can honestly say, I’ll never have to forget to remember to buy them again after using these gloves! I could probably stick my hand over an open flame with these on and be fine. Seriously, they’re that thick and insulated! Though a bit on the bulky side, they work so well at gripping any hot thing I’m picking up that I don’t worry about dropping it. They’re great to use when you’re grilling, too! How many times have those flames kicked up and singed your fingers? The gloves are also really easy to clean, which is a huge plus. Just wipe them off, run them under some water, or if they get super gross, they are even dishwasher safe. They were invaluable at Christmas with all the baking I did! I highly recommend them if you’re looking to replace your current potholders. As you can see, I really heaped my toppings on there. The thinner crust just begged to be inundated with cheesesteak goodness. Overall, it was a nice, simultaneously crispy and chewy experience that you just can’t get using regular doughy pizza crust, no matter how thin you roll it. And can we say TASTY? The chicken one was awesome, but I’m a sucker for the original beef cheesesteak, so that was my winner. 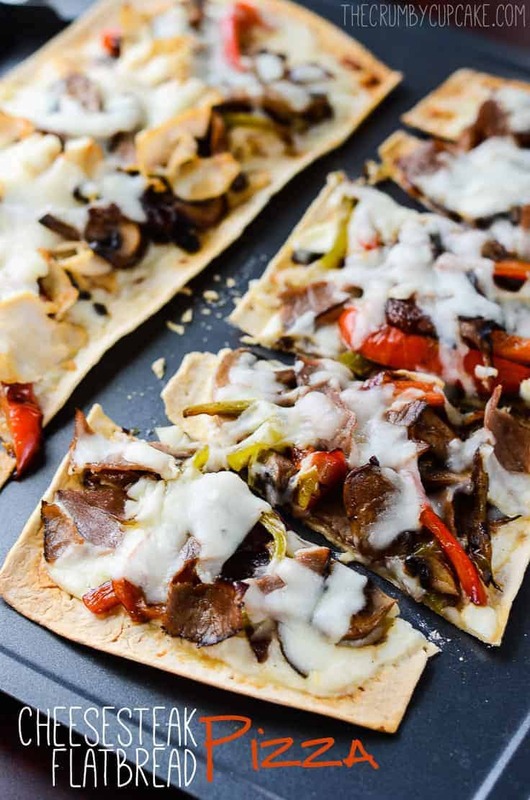 These flatbread pizzas would also be a wonderful addition to your next party (did I hear you say Superbowl?). Just slice them up and bam, finger food. Wow. So many flavor combinations to test out! [url href=”http://www.food.com/recipe/provolone-sauce-for-cheesesteaks-263644″ target=”_blank”]Prepare cheese sauce[/url], if you are using homemade. [url href=”http://www.amazon.com/gp/product/B004YVOF70/ref=as_li_tl?ie=UTF8&camp=1789&creative=390957&creativeASIN=B004YVOF70&linkCode=as2&tag=thecrucup-20&linkId=EQ5OKZ37C34YB4HK” target=”_blank”]White Queso Blanco Velveeta[/url] or [url href=”http://www.amazon.com/gp/product/B006NMGC4C/ref=as_li_tl?ie=UTF8&camp=1789&creative=390957&creativeASIN=B006NMGC4C&linkCode=as2&tag=thecrucup-20&linkId=EVSFN3UDAFLF7EBO” target=”_blank”]Cheez Whiz[/url] can be used in a pinch. Preheat oven to 375 degrees F. Place pizza crusts on ungreased baking sheet, then bake for 2 minutes. Remove from oven and set aside. Slice up veggies. Slice deli meat in to ribbons and place in a small bowl. Set aside. In a medium pan, heat olive oil and butter over medium heat. Add onions and peppers, season with salt and pepper, and saute for 8-10 minutes, stirring occasionally until onions start to caramelize and peppers are soft. Add mushrooms and saute 5 more minutes. Remove to bowl. Add deli meat to same pan (no need to clean it), and warm it for about 2-3 minutes, stirring it around to soak up the leftover juices and so it doesn’t stick to the pan. Spread 1/4-1/3 cup cheese sauce over each crust, leaving about 1/2 inch empty on the edges. 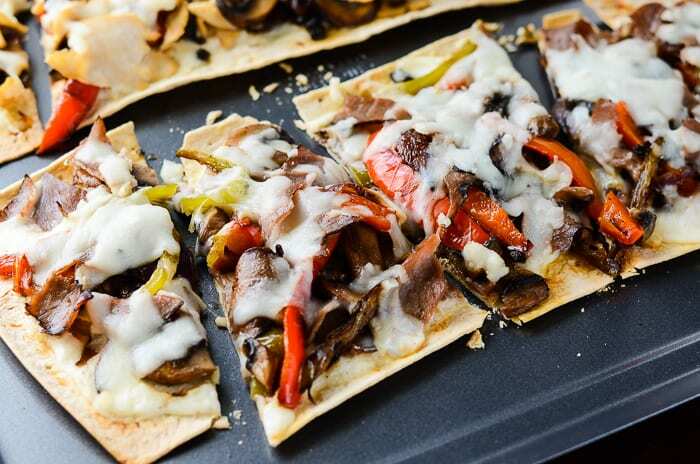 Top flatbread crusts with roast beef or chicken ribbons, veggies, and mozzarella. Drizzle on remaining cheese sauce if you’d like. Bake an additional 6-8 minutes, until cheese is melted and crust is nicely browned. Slice and enjoy! How do you top your pizza? For even more awesome recipes perfect for your football shindig, follow me on Pinterest!Follow Erica Acevedo’s board Food | Party foooooods! on Pinterest. I think just about anything is fair game for pizza toppings! 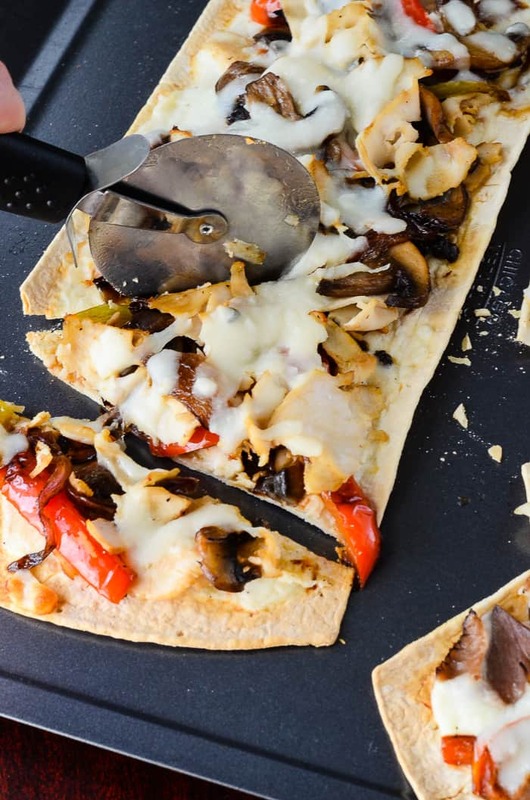 I love the flatbread pizza idea…way less calories in the crust that way! Ooh, this looks really yummy and now I am hungry! Thanks for this recipe, I’ll have to try it! Awesome. This is right up my alley. Pinned and added to next weeks meal rotation! Yumm! This is a great idea!! How many Nom Nom’s can I give this? This looks amazing and seems easy enough. I love the gloves. Those are some things we def need. The gloves are seriously amazing! I use them all the time, now. wow, these look delicious! i will definitely be trying this one out! and your photography is amazing! pinning and stumbled! Oh my goodness this looks mouth water delicious! I can’t wait to try it! I pinned this to my Game Day Board! You’re photography is awesome and capturing every delicious part of it too. Thanks, Sarah! I hope you enjoy! This looks very delectable. Thanks for the new ideas. YUM! I pinned this so I wouldn’t forget it. Looks delicious! Thanks. Love this!! Such a simple yet gourmet idea 🙂 Looks so tasty! It would definitely fancy up a SuperBowl party, lol! Thank you! Oh My! This looks heavenly. I’m so going to try this after I finish my cleanse. Never have I made a flatbread pizza before! This is totally something I need to try.. love the crisp base against all that delicious topping! It’s SO delish! I agree, the crispy base is great – so different than what you’re used to in pizza. Thanks for the recipe! 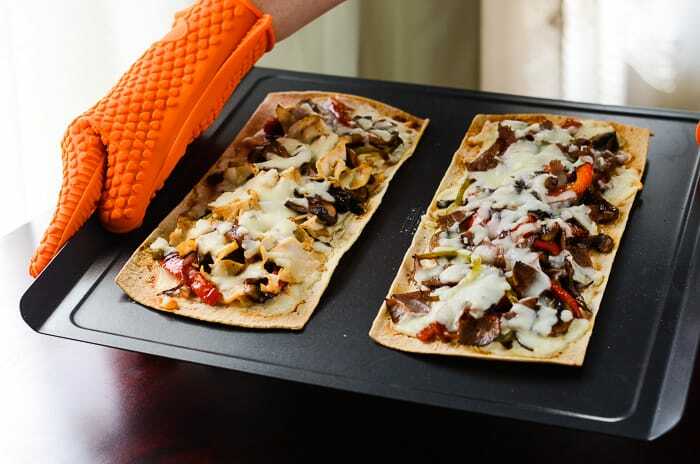 Flatbread is a great idea if you don’t feel like messing with dough. Usually for us we mix 2 or 3 different types of cheese on our pizzas!